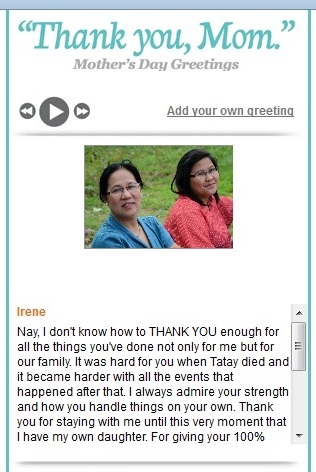 I'm so happy I saw my Mother’s Day greeting last May 9 through smartparenting. I don't often tell my Nanay how thankful I am for everything. We do argue on a lot of things but having her in my life is a BLISS! Nay, I don't know how to THANK YOU enough for all the things you've done not only for me but for our family. It was hard for you when Tatay died and it became harder with all the events that happened after that. I always admire your strength and how you handle things on your own. Thank you for staying with me until this very moment that I have my own daughter. For giving your 100% support, encouragement, and for allowing me to experience motherhood with your help. I'm sorry for those points in my life that caused you pain. I know you're prouder now with all our achievements. I will always remember what you said, that MOTHERHOOD is a lifetime COMMITMENT, I will do the same with my daughter. I love you so much Nanay. We all do. Happy Mother's Day! I think you could still submit your greetings. Just check here. P.S. Gift certificates from Mariko Tokyo Skin & Body Centre worth P3000 up for grabs! Well done for being featured. It's a lovely message & i'm sure you're mom was so touched by it.